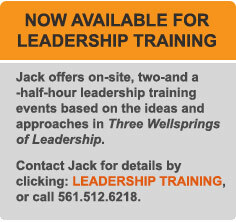 During the time that I was leading the Southeast District of the Florida Department of Environmental Protection (2007 – 2011), we sent one of our promising young Staffers to attend a five-day training on Leadership (a traditional “how to be a leader” course). When she returned, I stopped by her office to ask about her experience. She was very enthusiastic about the course, and she asked me to read The 21 Indispensable Qualities Of A Leader (John Maxwell, 1999), a book that had been given to each participant. I read the book. There is a chapter devoted to each indispensable quality. The chapters contain quotes from other persons, outlines, advice, and slogans related to the different qualities (which can also be referred to as “character traits”). I was left with some questions. If you ask subordinates what they want in a leader, they usually list three things: direction or vision, trustworthiness, and optimism. Like effective parents, lovers, teachers, and therapists, good leaders make people hopeful. Maxwell’s large number of allegedly indispensable qualities, and Bennis’ succinct description of leadership prompted me to start down the path of trying to identify the sources of Leadership. I have asked my leaders to “think” about the idea of Leadership. I make the case that the Wellsprings of Character, Hope, and Imagination are the seminal sources from which flow those aspects of Leadership that are relevant to the presenting opportunity or challenge. I claim that one can be an authentic and artful Leader without having to be preoccupied with the presence, absence, or condition of allegedly indispensable character traits, and without having to immerse oneself in the latest leadership craze. My approach could be described as ontological in nature, as opposed to being merely descriptive of leadership traits, principles, approaches, etc. I describe Leadership as something that transcends character traits. 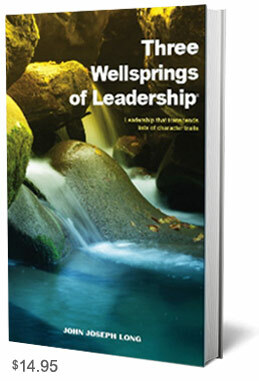 The authentic and artful Leader leads from spontaneity and grace, inspired by the three Wellsprings.